John Benzee is an author, illustrator, and filmmaker. He loves the outdoors and lives in Western New York. This is his second picture book and his favorite fruit is the blueberry. What Am I? Fruits is a children’s picture book written and illustrated by John Benzee. 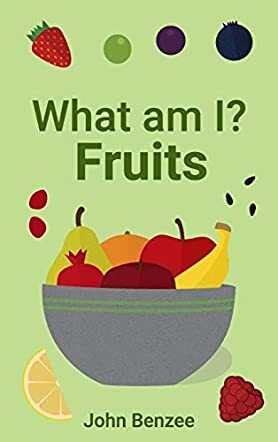 In this fun and informative book, the author presents a series of rhyming riddles about different fruits with accompanying illustrations of the fruit, how it’s grown and what it looks like. He covers each of the basic fruits one finds in the supermarket or grocers, and describes how they taste and any strange aspects, such as the gritty consistency of a pear and the fuzzy outside of a peach. The name of each fruit is not immediately revealed so kids can guess as they read. Benzee also includes a chart that shows all of the fruits and reveals how they are grown. The author notes that he uses the USDA descriptions of the fruits he includes, rather than the botanical classifications, and he doesn’t draw the fruits to scale. What Am I? Fruits is a fun and educational book that helps kids learn more about the fruits they eat. Benzee’s rhymes are entertaining and clever, and his colorful and inventive illustrations work quite well with the riddle theme of the book. What Am I? Fruits is a grand option for story time, one that’s bound to elicit volunteered guesses and answers to each riddle. I also appreciated the chart that the author includes in the back of the book; it really helps to get kids familiar with the fruit they eat. It’s also a perfect primer for early readers. What Am I? Fruits is most highly recommended.